Radish season just might be my favorite produce season! The air is cool and fresh, everything is blooming and blossoming and ripe! And radishes are poking their little red faces up from the dirt! There is nothing better than digging up a bright, round little gem of a radish and chomping into its crisp, juicy, spicy deliciousness. Radishes are soooo underrated! And don’t get my started on the oft-tossed greens! When its radish season, this Radish and Celery Salad is my go-to recipe! My everything crunchy, spicy, crispy, savory, sweet, juicy, tangy spring in my mouth recipe! Full disclosure: I didn’t create this recipe. I’ve had it pinned in my Pinterest recipes board for years, and go back to it any time I happen to find enough delicious radishes to make it. I’ve tripled it so that I can continue eating the leftovers the rest of the week. It’s particularly good after a day or two. For extra crunchy deliciousness, try it on crackers. I’ve made it sliced, chopped, whirred through my food processor, but my new favorite way to make it is to spiralize the radishes, apple and onions.
. (If you don’t have one of these, seriously, you should try it. Of course, other spiralizers will work as well, but – another disclosure – I’ve never had a plastic spiralizer that didn’t quickly break or bend at the blade. And I know many have lifetime warranties, but after a while, it’s annoying to have to keep getting replacements). So why am I sharing a recipe that isn’t mine here on my blog? Additional disclosure: I’m not sharing it for you. Not that I don’t love you all and want you all to share in the joy of tasting this crunchy, crispy, sweet and savory, herby deliciousness. I’m sharing it, because the recipe seems to have disappeared from the compendium of the internet. I have one water/radish stained, torn and wrinkled old-school printed copy. It’s barely legible. And once that’s gone, my beloved radish and celery salad will be gone too. I’m doing it for me, y’all. I need this salad to live on. To be celebrated. Like spiralized veggies do. I’m sharing, because I don’t even know who originated the recipe, as my printed copy only indicates that is was inspired by Vegan Chef, Matt Samuelson. I’m sharing, because even searching through any and all Matt Samuelson recipes, I can find nothing like it. Thank you, mystery person who was inspired by some long-ago Matt Samuelson recipe to create this delicious recipe that makes my beloved radishes shine! Carefully slice celery stalks very thin using a mandolin or a knife, chopping tops and leaves. Spiralize radishes, apple and onion, trimming spirals into bite-sized pieces. Alternatively, you can slice thin, chop or julienne. Mince sage and rosemary leaves. Add all ingredients to a large bowl and drizzle olive oil, lemon juice and salt. Mix everything together, taste and adjust seasonings. Store in glass container in refrigerator for 1 week. If you try my Radish and Celery Salad recipe, I’d love to hear what you think!! 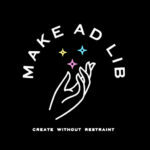 Please leave a comment below, or instagram with the hashtag #makeadlib . Don’t forget to tag @makeadlib so I can see your delicious creation!